Alinghi is the Swiss team assembled by Ernesto Bertarelli in 2003 to race the America’s cup. 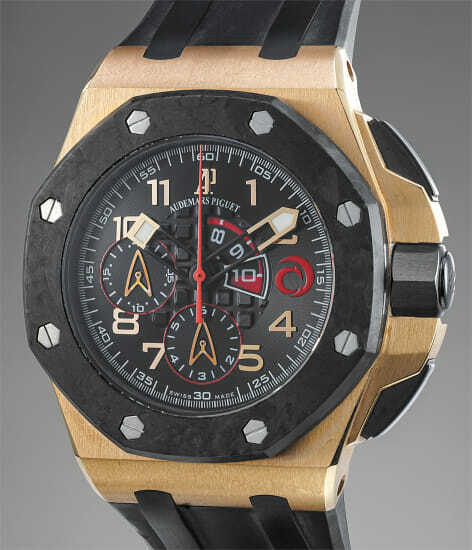 As official sponsor, Audemars Piguet released a limited edition of 600 pieces, to commemorate its second victory in 2007. This Royal Oak Offshore distinguished itself from the normal production by the fusion and high technicity of its materials. The black ceramic dial proudly displaying the red Alinghi logo is surrounded by a forged carbon bezel set in a pink gold case with a bracelet made of a special rubber. The caseback is beautifully engraved with a picture of the team in action proudly displaying the brand’s name on their boats and the individual number 094/600. The watch provides the wearer with a flyback chronograph, a 20 minutes and a 6 hours subdial as well as a regatta countdown. This bold and extremely masculine wristwatch is presented in excellent condition accompanied with its original box specially customized by Audemars Piguet to represent a sailboard winch.